Alternatively, you can use an external drive that is prepared for offline imaging. For more information, see the Offline Imaging Knowledge Base article. On the target computer, boot to a startup disk other than the target drive. Open Jamf Imaging and authenticate locally. Authenticate to the Jamf Pro server when prompted. To add the computer to a site, click Site and choose a site. Choose a drive to image from the Target Drive pop-up menu. 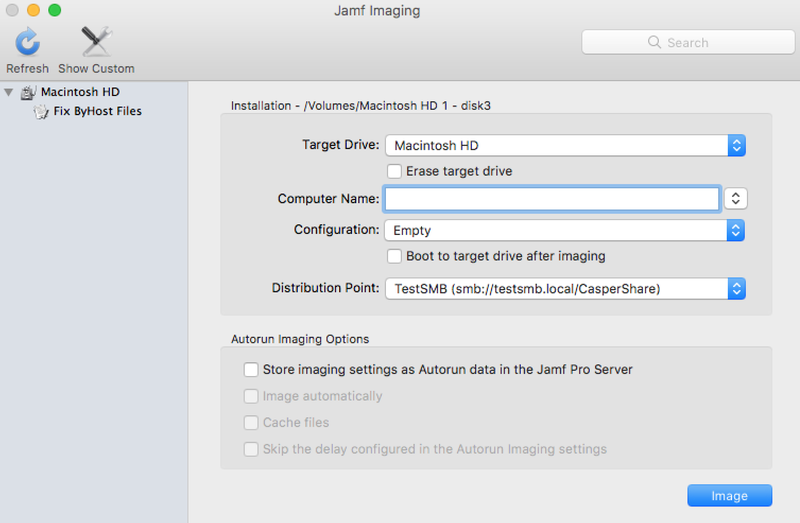 To erase the target drive when the imaging process begins, select the Erase target drive checkbox. Assign a name to the computer by entering a name in the Computer Name field. Alternatively, use the arrows to choose "Computer Name", MAC Address", or "Serial Number". The value for the option you choose populates in the field. Choose a configuration from the Configuration pop-up menu. 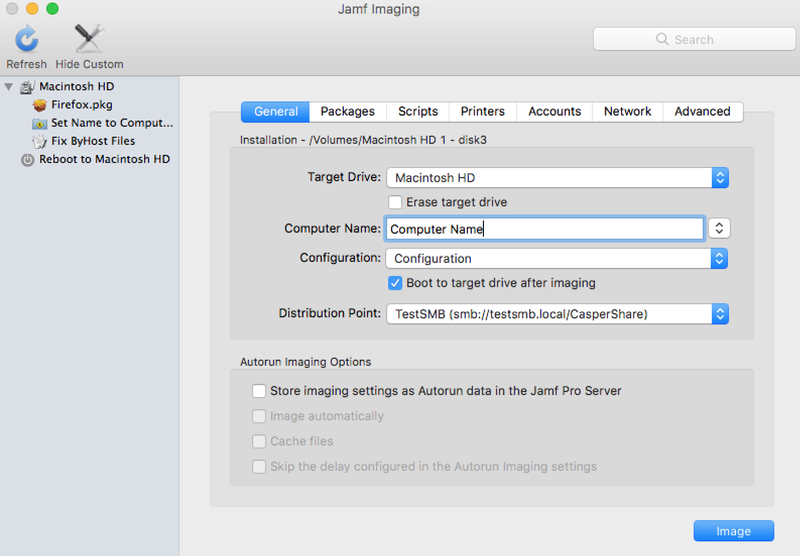 To boot the computer to the target drive after imaging, select the Boot to target drive after imaging checkbox. Choose a distribution point from the Distribution Point pop-up menu. (Optional) Use the options in the Autorun Imaging Options group box to configure Autorun imaging options for the computer. For more information on Autorun imaging, see Autorun Imaging. (Optional) Click Show Custom and use the tabs and options to customize the imaging process. For an overview of each pane, see Customizing the Imaging Process. Find out how to view Jamf Imaging logs for a computer. Find out how to view event logs for Jamf Imaging events.